Shamwari Game Reserve: Welcome to Shamwari Game Reserve, the ultimate luxury Big Five African safari adventure and conservation effort coupled with responsible tourism. Shamwari Private Game Reserve is home to Africa’s Big 5, and is malaria free and is situated in the Eastern Cape of South Africa. This reserve has received numerous international awards, including the World’s Leading Conservation Company and Game Reserve for many consecutive years. Shamwari is about conserving a vanishing way of life and is the realisation of one man’s dream, and the success of many people’s passion. Steeped in pioneer history, and dating back to the time when a multitude of game roamed wild and free, the 25 000 hectare reserve boasts five eco-systems, thus enabling the support of many forms of plant, animal and bird life. Shamwari is situated in verdant bush along the Bushmans River, halfway between Port Elizabeth and Grahamstown, a pleasant drive from Cape Town and forms a natural extension to the famous Garden Route. Luxury accommodation is offered in 7 different lodges at Shamwari Game Reserve, all of which are 5 Star graded. Choose a lodge that perfectly compliments your ideal African experience. 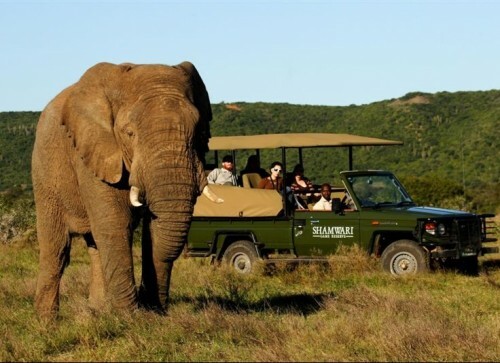 When you visit Shamwari Game Reserve, we would want you to have the ‘safari of a lifetime’. We will assign a personal game ranger to your group of six, your game ranger and lodge manager will design your daily program with you. We want you to experience, learn and enjoy the very best that African wildlife viewing can offer. To achieve this goal, we have brought together the best that the area has to offer. There is great game viewing, in modern open game viewing vehicles that have been especially converted to maximise comfort and viewing potential. Your personal game ranger will provide insightful and valuable information about the fauna and flora. In between game drives your time is filled with relaxing, reading, spa treatments, swimming, enjoying delicious cuisine, a game walk, or a visit to one of the two Born Free Big Cat Sanctuary’s. For children on a Safari, this is a truly unique, educational and fun family safari. The colonial-style, Riverdene Lodge with nine inter-leading luxury rooms, rim flow pool, supervised playroom, spacious green lawns and jungle gym facility will ensure entertainment for the whole family. Anonymous, South Africa: Fantastic Fantastic Fantastic! We will be back. Mike Watson, United Kingdom: The experience was marvellous with the game drives being the focal point of our stay. Our ranger, Darryn, was extremely knowledgeable and was persistent in ensuring we got the best possible chance to view as many of the animals as possible.The accommodation, quality of food and service were excellent. The bedrooms were luxurious. The staff couldn’t do enough for you and were very attentive and efficient without being over elaborate. The food was very well prepared and varied.All in all an unbeatable experience. philip bennett, United Kingdom: Apart from the two Land Rover breakdowns that we endured on our first game drive! (which the staff handled very well), the experience was fantastic. For someone without much time (we only stayed for one night) you get to see a lot of game in just two game drives, from the pride of lions, wild dogs, elephants, giraffes and antelope. We didn’t get to see buffalo or the elusive Hippo (despite the great effort of our knowledgable and lovely guide). Would recommend the luxury tented camp for an authentic safari experience.